Our Winter/Spring Class Schedule is now available! Go to treadleyardgoods.com/classes to see the full listing! We have tons of fun classes, including plenty of NEW offerings! Learn to sew with knits, fit pants, make corsets, copy existing garments, sew oilcloth, and so much more! To register for any class, call us at 651-698-9690, or simply register in person at the store. Please register early - space is limited! We have some new Liberty of London cotton lawn prints. Richly saturated florals and patterns with lots of intricate details cover these smooth cotton fabrics. Perfect for blouses and dresses, or whatever you can come up with! Our Winter Sale continues! ALL fabrics and trims - including wool, silk, and oilcloth - are at least 10% off, with huge groups at 20%, 30%, and 50% off! Stop by now through Sunday! We will be open 10-5 on New Year's Eve and 10-6 on New Year's Day. We have some cute new printed cotton corduroy in the store. Take a look! This fine-wale corduroy is soft and napped like velvet, but has fun of a print the and the easy care of cotton. Use it for pants, dresses, shirts, and jackets for adults or children. We have a great selection of cozy Cuddle fabrics this year. These soft, fleecy fabrics have a furry pile and are ideal for snuggly bathrobes and blankets. Get comfy with Cuddle! We have several bolts of cotton corduroy new in the store! Cozy and soft, it's the perfect fabric for warm winter trousers, skirts, and dresses. A few of them have a little stretch woven in for extra comfort. We have two new cotton prints in the store that measure up at a whopping 108" wide! These extra-wide fabrics are perfect for quilt backs and duvet covers - with no piecing! New Anna Maria Horner fabrics! We have some fantastic new fabrics from designer Anna Maria Horner. First up these bright cotton prints. We also have several of her prints in drapey rayon challis. Perfect for dresses, blouses, and skirts! A few weeks ago we shared some gorgeous bridal lace, but lace doesn't always have to be white! We have a huge assortment of colorful lace fabrics in the store for your perfect special occasion ensemble! Get holiday party ready with fun, elegant lace! This beaded and embroidered net is deep turquoise, with silver threads mixed into the embroidery. Here's a detail from a warm brown and burgundy beaded lace. This honey-colored net has embroidered and sequined feathers! Silver is so wintry and magical. This very fine net has soft embroidery and sequins. Want something simpler, but still packed with bling? This silver net is covered with shimmering sequins. Here's a lovely brown net enriched with metallic copper embroidery and beads. Bling not your thing? These laces have plenty of color, but without the beading. There are so many more lovely laces in our store! Come in and find your perfect holiday look. We have some lovely new rayon batiks in the store. With the rich, saturated colors of batik prints and the smooth drape of rayon, these are great for blouses, dresses, skirts, and scarves. We have some new cotton prints with a science, math, and engineering theme. These geeky quirky prints feature airplane schematics, mathematical formulae, handwritten text, diagrams, and more. They would be perfect for quilts, crafts, or a novelty shirt or skirt! Come take a look at all of our great novelty prints! 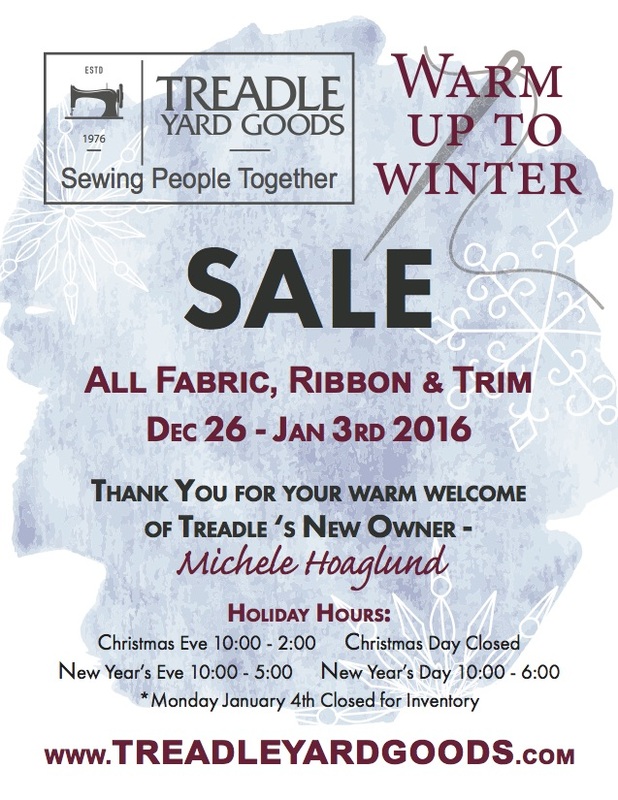 Visit Treadle this Saturday, December 5th during the Grand Meander! We will have delicious cookies and free sewing and craft demos in the store. Stop by and learn how to make some great holiday decorations and gifts! 1:00 Infinity scarves - a great gift! 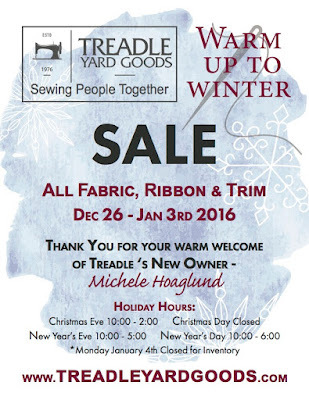 So meander on over, and find something wonderful at Treadle Yard Goods. Winter has just begun here in Minnesota, and we have months of snow to look forward to. Why not spiff up your winter wardrobe with a beautiful, warm new coat? Our huge selection of wool coating is just what you need! Here we have a rack of wool Melton, a thick, soft wool that has been woven and fulled (slightly felted) to create a dense, almost windproof finish. We have all the great patterns, notions, and unique buttons you need to make your dream winter coat a reality! Stop by and see.